G’day mate, Wanna make your iPod rock? Get a pair of AktiMates designed by our friend the legendary Mike Creek of Creek/Epos fame! What you get is a Creek amplified Epos speaker with an embedded iPod dock and two additional inputs for listening to a source other than your iPod. When the iPod isn’t in use, there’s a hinged cover built right into the speaker that folds down flat to conceal the dock. They even come with a cute little remote control. I’m tellin’ ya mate, these stout puppies are the dog’s balls, they’ll squash whatever tin boom crap plastic box you’ve been using to blast your music. 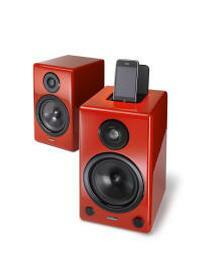 Awarded “Best Desktop Speaker of 2009,” by UK’s What Hi-Fi. AktiMate is an Australian company that co-developed and licensed technology from Creek Audio and Epos Loudspeakers. Aktimate is essentially, a Creek amplified Epos speaker emblazoned with a stroke of Aussie swaggar. AktiMate Mini is an active 2-way system negating the need for a separate amplifier as it has its own 40 Watt per channel amplifier built in to one of the speakers. In early versions the iPod dock was clearly visible - it is now concealed under a cover flap on the top of the active speaker. This dock also accepts the iPhone. The rear panel jack plug accommodates the connection to an MP3 or MP4 player or your computer via the 3.5 mm input. RCA stereo inputs permit connection of any hi-fi source product, e.g. CD Player, tuner etc. RCA stereo outputs to allow for the connection of a subwoofer. It is important to note that the USB connection can only be used for charging purposes. Should the desire be to run a second pair of AktiMate Mini speakers, the RCA outputs accommodate daisy chaining which will provide independent volume control in each location. It has composite video output for connection to a larger monitor (handy if your iPod has photo storage or video clips). Please note that this feature is suitable only for earlier edition iPods to version 5 and Nano version 2. The AktiMate Mini is Ideal for use as your television speakers - they are fully shielded, so placement alongside a monitor presents no problem. In versions manufactured before March 2010 (serial numbers commencing 1003...), an iPod will charge when it is in the dock. However new international regulations relating to Standby power mean this feature will no longer be available. Remember that the iPod will always charge whilst it is in use or when the Mini is not in Standby. A voltage selector switch permits a change of voltage should you wish to travel to a part of the world using different mains voltages. The volume control on the front panel allows ease of operation – a control which, with a simple press, takes the system into standby. The AktiMate Mini has remote control and comes with a small but perfectly formed handset! The remote handset not only controls the volume of the speakers plus mute and standby, but also all basic functions of an iPod. It comes in a choice of three dynamic finishes – gloss black, gloss white or gloss red. Each speaker stands 30 cm high. AktiMate Mini comes complete with a connecting speaker cable, a 3.5mm cable, rubber feet, an iPod accessory pack although this contains a selection only - the cradle which comes with your iPod fits neatly into the AktiMate dock. Woofer 130mm (5.25 ins) mid/bass with moulded polypropylene cone. Shielded magnet.